A business plan is a strategic tool that every business should have, even if you think you're "too small" to need one. A business plan is most valuable because it compels you to think holistically about your goals, assets, strengths and weaknesses, and closely examine any assumptions you're making. Mission, vision and core principles. Organizational structure and key leadership. Goals, market opportunities, risks and customer profiles. Action steps and resources needed to achieve long- and short-term objectives. Financial data, such as profit and loss, cash flow, sales forecasts and outstanding debt. A well thought-out business plan provides essential documentation to obtain financing. It may also be useful to persuade potential partners and suppliers to work with you. A business plan is also a way to take the pulse of your business and make projections about future growth. Is your business healthy? It serves as a mental exercise to see how, or even if, the business will work. 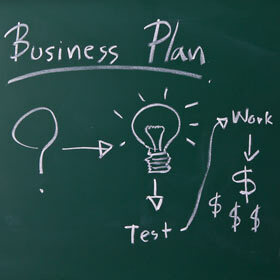 A business plan can also highlight problems and pitfalls if you are purchasing an existing business. "We were seriously investigating the purchase of a well-loved local business," says Katie McCaskey of George Bowers Grocery in Staunton, Virginia. "Once we gathered the necessary data to write a business plan we could see that this business lost money on every sale, with no solution in sight." The business plan exercise prevented McCaskey and her husband from buying someone else's problem business. Map a route, but look for new directions. Just as you need to balance your checking account to make sure your finances are on track, you need to check your business plan regularly to make sure you are on track with your goals. It is also important to ensure you're still making a profit. As Jeremiah Daly of Highland Capital Partners puts it, "…the business plan serves as a key road map to help the company navigate its way to success." Successful navigation frequently involves course corrections. The business plan is a "living document." If your business plan doesn't align with what you're actually doing, it may just be more a matter of revising your plan, not what you're doing. Be willing to adapt. "Being in business means to be ever changing and adapt to the changes that present themselves to you," notes Kristy Straka at Women on Business, "the challenges you might face in financing your business or other obstacles may lead you to alternative solutions that you might not otherwise explore." Don't be intimidated: You're not writing a Harvard case study or a textbook. You're just laying out your anticipated cash flow in a way that you can understand. Your business plan should fit the needs of your business. If, for example, you're not looking for financing, then you don't need a complete P&L statement in your business plan. You just need to tally and then visualize all the expenses flowing out and anticipated income flowing into your business. If you need help there are support organizations who will assist you, even for free. Locate your local SCORE chapter or community development agency for resources. Tim Berry, Founder of Palo Alto Software reminds new entrepreneurs that a business plan needs only to be as big as what you need to operate your business. Not everyone needs a soup-to-nuts formal business plan, at least to get started. "The primary value of the business plan is, as Paul Morin of Companyfounder.com, puts it, "the insights you gain into potential opportunities and pitfalls of growing your business…" He goes on to say that a business plan allows you and your team — even if the "team" is just you! — to 'get on the same page' and develop a common 'language' and understanding of the issues of your particular business, its target markets, growth potential." One way to ensure everyone is "on the same page" is to try to minimize the number of pages. Keep it simple. Quantity is not quality. As Entrepreneur.com writer Mark Henricks writes, there's no need to have business plans that run 20 or more pages. In fact, the shorter your business plan, the more likely it is to be read and understood. You and your management team don't need the long story because you already know the details. Use a business plan as a refresher now and then to check on your execution. Even prospective investors don't want to wade through page upon page of financials. One or two spreadsheets may be all that's necessary to get started. Your business plan just needs to get to the point, notes Kim Ann Zimmermann, of BusinessNewsDaily. You particularly want your Executive Summary to be concise. Although the Executive Summary comes first in the table of contents of your business plan, write this last. That's because the summary is a brief (two pages at most, preferably one) distillation of everything you've detailed in the plan. It's the "sell" that might get a potential investor to read more, or a "bird's eye view" of your company to give a new supplier. Be as clear, concise and to-the-point as possible. Eric Markowitz, a reporter for Inc.com, recommends that you ask a 5th grader or any other non-investors to read the plan. If they can explain what your company does, that's a great sign. If they can't, consider it a warning. Once you've got a business plan that works for your business, your employees and your partners, chances are it will work in the real world, too. The effort you put in here will pay off. Which, of course, is the whole point.